We lived in a mid-terraced townhouse in Nenagh for 7 years before we moved back home to Castlebar. It had a postage stamp sized back garden that was filled with dock leaves, thistles and piles of maintenance when we moved in. We wanted to grow some vegetables and herbs for the kitchen and soon realised the work involved even in a tiny garden. I distinctly remember discussing in amazement the people that grow vegetables for a living. After our own very limited and forgiving experiences in the garden, we will be forever in awe of people who do it every day. They are really up against it. If you get your produce grown in the first place, what with the war that has to be waged against weeds, slugs, aphids, blight, mice and other competitors, you’re still trying to compete in the market place with foreign supermarkets that are selling bags of carrots for 99cent; a product someone somewhere has paid the price for. Westport native Pat Grimes was a builder when the recession hit. He started doing odd jobs for people as building work waned and found that he was leaning towards the gardening and planting jobs more than others. He grew up on Reek View Farm in Carramore on the Westport to Leenane road. His parents always grew a wide variety of vegetables for the table, but Pat’s recollection is only of weeding. He never in a million years thought he would end up growing vegetables himself and would have laughed at the suggestion. But the apple doesn’t fall far from the tree. 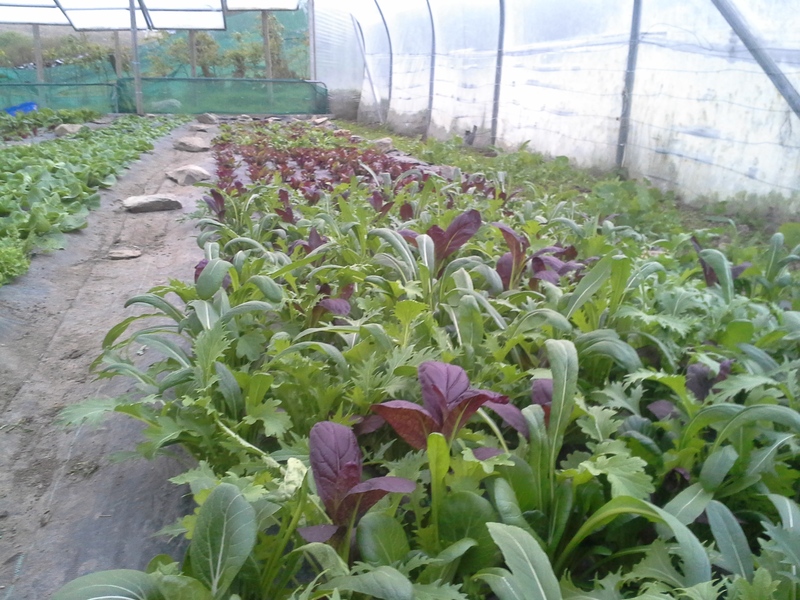 After doing a short organic vegetable course in Mayo Abbey, Pat knew that he wanted to study planting more extensively and attended the Organic College in Dromcollagher, Co. Limerick. 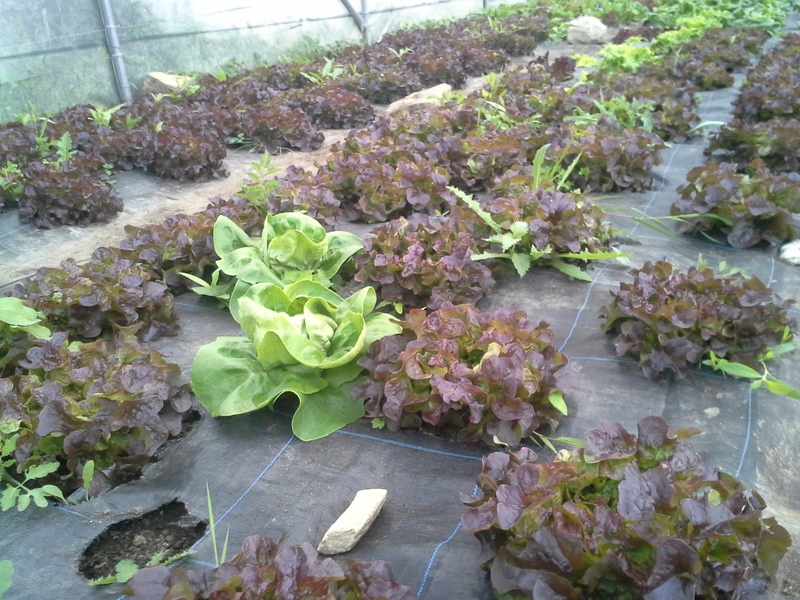 He had started developing his home place on Reek View Farm growing salads, vegetables and herbs. He grew everything at first to see what would sell and what people would be interested in. 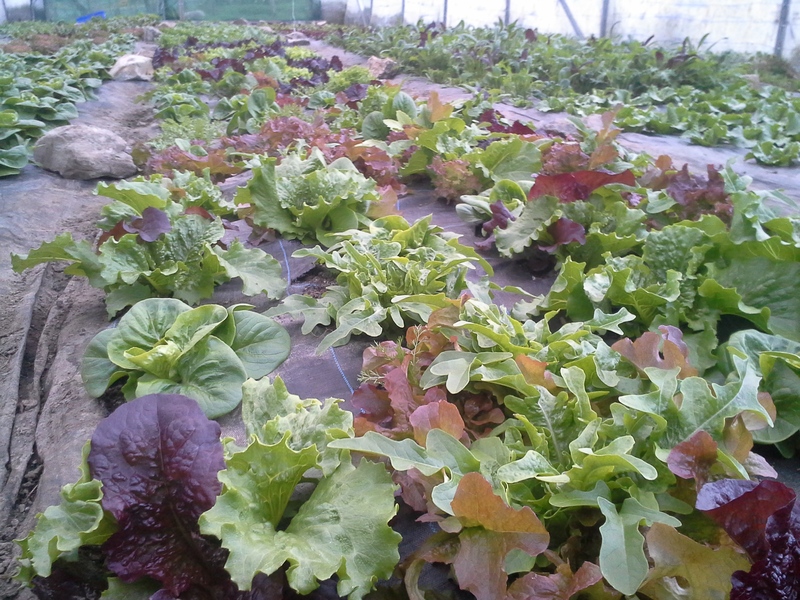 He also had to work out what he could grow and rotate on a farm that, while not certified organic yet, is based on an organic ethos utilising organic systems of pest control, rotation and composting. He started selling his mixed salad leaves, herbs (thyme, sage, rosemary, basil, parsley and coriander) and vegetables (for example: cauliflower, tomatoes, beetroot, courgettes, French beans, kale) to local restaurants and hotels. Sol Rio was his first client and the number has grown to include Sage, The Lodge at Ashford, Bar One, Seasons, Mill Times Hotel, Hotel Westport, The Pantry and Corkscrew and the Idle Wall, to name a few. He also supplies SuperValu and Centra in Westport and ourselves, De Búrca’s in Castlebar with his bags of Elia’s salad leaves. For his farmhouse eggs and any surplus vegetables he keeps an honesty box at the end of his farm lane – it seems a lot of people have making the spin out the Leenane road just for this. Pat’s leaves were recommended to us last year when we did our first proper De Búrca event at the Banbh Market on Rushe Street. We absolutely loved them. Not just because they were so varied, fresh and delicious but because we were dealing with someone at the end of the phone that was so calm, where nothing was a problem or an obstacle – which is probably why he grows vegetables. Despite having spoken to him twenty times on the phone I didn’t get to meet him until the day of the Market. He came to the stall with his wife Corey, a Californian who came as a volunteer to his farm two years previously and never left, and their little baby girl Elia in a sling. That was last year. Elia’s name is on his bag of greens in the shop now, and seeing as they are due their second baby this summer, I’m looking forward to see what else comes from Reek View Farm.